As the 1 comes across the volleyball 10 foot line, 5 foot after the midline, posts break out to screen for the wings, we're looking for the wings curling into middle. Or 1 penetrating down the middle. Wings rub off of screen and switch sides, as they are going the posts step down and screen again for them coming out. After posts screen they seal waiting for a dump in from the point. SPECIAL PLAY (42 FIST) would have 3 screen for 2 coming through the middle along with 4 (double screen) to set up 2 for the 2or 3 pt. jump shot. 1 may need to pass to 5 and get the ball back to have this develop. 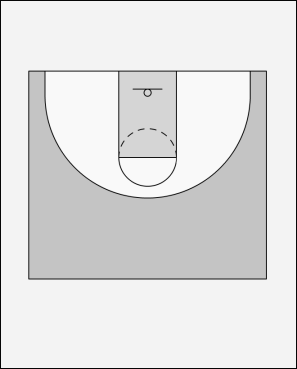 1 is looking for either 2 or 3 coming off of the screen for a jump shot or the posts stepping in on the seal down-down low. 1 passes to a wing then screens away, and we are into our motion set(30) posts react to the way the defense is playing.